A good bong is a stoners best friend. Most of you have already tried one, and a few of you probably bought one right after hitting it for the first time. A clean bong can be healthier than smoking a joint. The water is filtering a lot more bad chemicals out while the smoke is traveling through the chamber of the bong. Sadly, most of us would still never think of buying a glass bong. For too many people bongs are still not comfortable to take out. Especially when marijuana hasn’t got legalized in the country you’re living. Do you think that bongs are too big and you can’t take them out? Luckily for you that you have found this blog post today that will change your mind. I’ve done a research about finding the very best alternatives to a regular glass water bong. When you are looking for a bong alternative, it is important to think about how often you are going to use it and the amount you smoke. Let me tell you that there are plenty of cool smoking accessories that you can get. 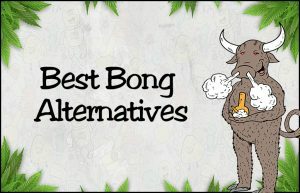 If you are looking for a great bong alternative, it is important to think about what is bothering you about one. There are a lot of reasons why I like to hit a glass bong. I’m trying to live as healthy as I can, and a clean glass pipe or water bong is helping me to do that. But what is better than a big bong? Seriously, the only thing which is a bit annoying about a regular glass bong is the size. There are glass pipes which are the same good portable as a vape pen for example. Portable – Smoking marijuana in a mini bong is a lot more comfortable if you love to hit average rigs or bongs. 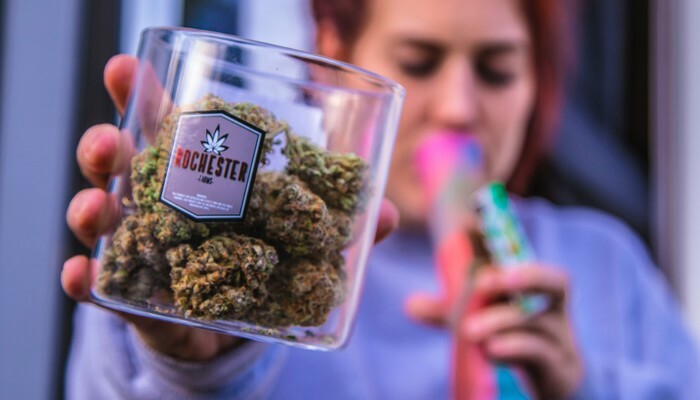 While most of the regular bongs are not easy to transport you can get a few excellent ones in a size of a Starbucks coffee cup and even smaller. Stealthy – An average size for a regular bong is around 30cm, that makes it hard to put it anyway without being seen. A mini bong can solve this problem quickly. There are super small ones which you can even put in your pockets. One of the stealthiest and discrete ways to smoke marijuana. Efficient – Don’t let the size fool you. Even from the smallest bong in the world, you can take decent hits. But keep in mind that the bong should not be too small so you can still put weed or dab on it. Save Money – A smaller bong can be way cheaper than a regular glass water bong. I would still suggest taking a quality product for the best smoking experience. Some mini bongs will give you massive hits while others are more being discrete and give smoother hits. Think again about what bothers you the most about a regular one. Choose a bigger one if you want to get larger hits or a smaller one for being more portable and discrete. Read the rest of this post to find one that suits you perfectly. Even a smaller bong or pipe can get pricey if it is a quality piece. You can find everything from cheap to expensive. There are a lot on the market but which one should you use? Think about how much you usually spend on your smoking accessories and the amount you smoke. Let me tell you that a quality glass water pipe can cost you over $200. Are cheap mini water bongs any good? – Most of them are pretty good. You can look up for companies that have already a small fanbase growing and a lot happy customers posting pictures and creating reviews about it. Why should I buy a small bong? – Apart from the savings and portability, a good mini bong is a handy way to smoke marijuana in public. If you love to hit a bong as often you can, you should know how frustrated it can get to transport it. What are the most popular and best bong brands? – There are a few leading ones like Empire Glassworks, Boom Felazi, Honey Supply, High Tech Glassworks and Burner Glassworks. But also new brands like are providing quality pieces that you can trust. – The best way to buy one is directly head over to a respective website from a glass provider. You can simply take the brands that I have mentioned above or follow the links in this post. Cool mini bongs for marijuana and wax are a super comfortable way to smoke your bud or concentrates stealthy, quickly and easily anywhere you want. Even with a cheaper mini glass pipe, you can get amazing results. Grav Cup – The Mini Slushie Water Pipe Inspiration! One of my favorite bong alternatives is the super mini grav cup which is a water pipe from Grav Labs (Take a look at DopeBoo a new awesome online head shop for the grav cup, bongs, vaporizers, glass pipes and much more.). This water pipe which looks like a slushie cup is the perfect all-rounder when you want to take a hit in public. This cup is a pretty decent little smoking pipe that you can take anywhere. This small glass water pipe made from solid scientific glass is one of the best choices for smoking dry herb or wax in public. This perfectly portable 7.5-inch size glass pipe that you can load up with over a gram of ground material as well with an angle cut dome for your lovely wax. You have the choice between classic crystal-clear glass, ice blue accents, or a sharp dark style. Make it your own by following the links in this post. Some of the mini pipes are definitely worth their price even though they a bit pricey. There are a lot of glass bongs on the market. Make sure you look at the brands we have mentioned in this blog. An excellent way to find other amazing small glass accessories is to check on Instagram and other social medias for reviews like ours.